When modern multiplexes are becoming more and more sterile - with increasing smell of popcorn, no curtains, robotic automation presentation, flat screens, and a basic lack of authentic cinema atmosphere - what is the whole point of going to the movies, when it largely looks like your own TV set at home? 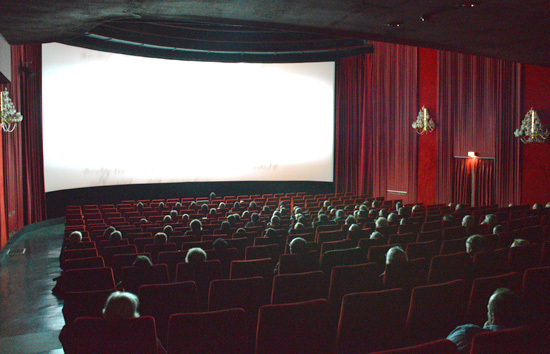 Every year in October a group of around 200 people gather together in a cinema in Baden-Württemberg, in the southwest region of Germany. The city is Karlsruhe, and along with being a fascinating city, Karlsruhe offers a unique film viewing spot, the Schauburg theater. For these particular events, a large part of the audience comes from Germany of course, but there are guests from all over Europe, the United States and as far away as Japan. What are they doing? They are watching classic 70MM films, many of which they often have seen many times before. Between 9 and 11 roadshow films in three days is enough to put most people asleep, but not this audience. During intermissions, the audience discusses how things were better in the old days, debating the always-popular subject of "Do you show a blank screen or not? ", and exactly when they saw one particular film the very first time. Aesthetics and academic talks like these fascinate these folks, when the historic 70mm prints are shown. 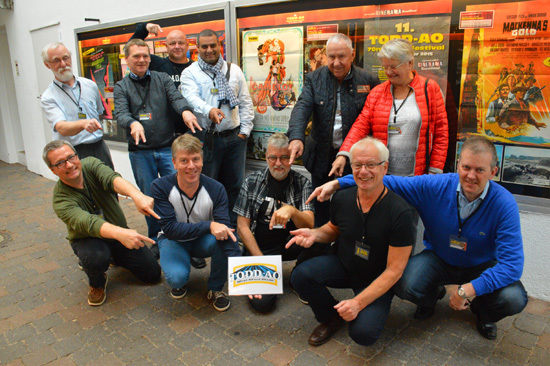 Although a lot of effort is put into attracting the mainstream, and younger Karlsruhe citizens, to be in the audience, the typical festival goer is often male, often upwards of age about 50, who comes back year after year to witness the former glory of cinema going. Some of the hard-core 70mm audience refer to themselves as "crazy but happy" - including the author of this report. 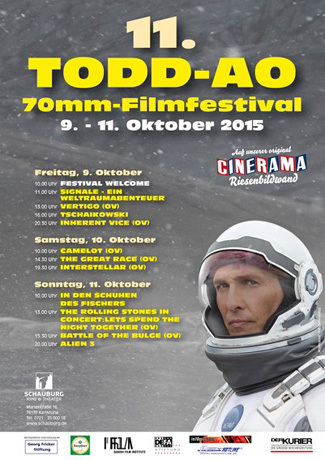 The Todd-AO Festival at the Schauburg is about going to the movies in style. Seeing the films at the Schauburg is like seeing the films as they were originally presented - in a big cinema, on a huge curved screen with red curtains and a Gong [an instrument played by the projectionist just before the films starts, to get your attention]. It's all about showmanship and presentation, and very few cinemas today - if any - do it better than the staff of the Schauburg. Projectionists Vincent Koch and Marcus Vetter have worked many weeks preparing each 70mm print for this weekend, and the work they put in to it pays off. All films are presented flawlessly with perfect focus and sound. Every sound issue is being addressed by sound specialist Gunter Oehme, who has preauditioned and optimized the sound for each film. Sometimes he is even sitting on the last row with his laptop to monitor, adjusting each sound channel individually. The Todd-AO Festival is unique in the sense that it presents ultra-rare 70mm films. Where else can you see DEFA 70 films from the DDR, or rare short films in MCS 70 Superpanorama? Where can you see the campy 1970s "Earthquake" presented in 70mm and including the bone-rattling rumbles of SENSURROUND? "Mainstream" and audience favourites are also presented in blazing 70mm film with 6-track sound. Everything is presented in 70mm. No digital stuff when vintage 70mm prints are available. 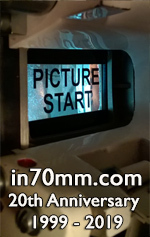 Digital DCPs, with all its virtues and qualities, can be seen everywhere, but 70MM cannot. I am not interested in travelling to see a digital replica of a film - I want to see the original. As 70mm cinemas are becoming "rare species", the 70mm experience will become even more unique, and worth travelling for. The Schauburg Cinerama cinema is a classic cinema from 1927, with roots dating back to 1906. Mr Herbert Born (b. 1954) is the manager of the Schauburg and he is taking great care of the cinema. It is an independent cinema and arthouse for the city of Karlsruhe. Herbert Born started running the Schauburg in 2005, and has won many prizes and awards for his work. The Schauburg is a member of Europa Cinemas, a film theatre network focusing on European films. The exterior facade is decorated with two large, and recently renovated, red and blue S C H A U B U R G neon signs. A 6-meter wide hand painted billboard sign sits right above the entrance doors with flashing "runner" lights encircling it. The sign is created by retired painter Mr. Hass, who has painted such boards in Karlsruhe since the '60s. Probably the ONLY sign with a CINERAMA logo in existence today. The box office is right inside the glass doors, and as the guests proceed to the cinemas they pass the bar and concessions. The floors are black marble, and reflects the lights from the ceiling. The grand cinema is called "Schauburg" (350 seats), but there are two additional screens, "Bambi" (61 seats, 5 x 2 m screen), and "Cinema" (150 seats, 10 x 4 m screen). "Cinema" screen is upstairs via the listed grand staircase in the old balcony. Projection room with Kinoton ST270 in foreground and DP75 in the back. The Schauburg was completely rebuilt in 1968, when Cinerama Inc. four-walled it to present "2OO1: A Space Odyssey" in 70MM Cinerama. The projection room was moved downstairs to house the new Philips DP75s, and a new curved screen was installed. Today, the great Schauburg is constantly updated. New screen, seats, ventilation, speakers and floors. All 17 curved rows are on a gentle slope (raked) so everyone has a good view of the 16 meter curved screen. Everything is covered in Cinerama-Red drapes, the walls sporting some classic chandeliers, and energy efficient LED lights in the ceiling. The new Harkness screen was ready for the premiere of Terrence Malick's new movie "Knight Of Cups” in 4K on September 10th, 2015. "It is a Harkness Perlux 140 with a 1,4 gain which helps to reduce the cross reflections of the deeply curved Cinerama screen at the Schauburg. The older screen was 9 years old and we needed to replace it. Since we can take the screen aside and use the back stage for live performances too, wear and tear was starting to show on our screen. In fact, we have already taken the old screen down to inspect the speaker systems. We have 5 stage channels of ALCONS type CR4 speakers. We installed them in 2010, and have been very happy about their natural sound and performance." The screen is 16,15 meters wide along the curve, screen chord is 14 meters, Todd-AO height is 6,4 meters, and the depth of the screen is 3,45 meters. Projection distance is 23,8 meters, radius is 8,8 meters and screen curvature is approximately 105 degrees. The curved screen has both vertical and horizontal moveable masking and covered with a "Cinerama red" curtain. In 2010 the entire B-chain behind the screen was re-installed with 5 channels of ALCONS ribbon speakers (L, LC, C, RC, R) all tri-amped with customized Finite Impulse Response (FIR) type cross-overs. 22 JBL surrounds speakers are hidden behind red draping throughout the cinema. The draping was specially selected to perfectly match the surround performance of historical needle sound following the good old cinema owner practice performance follows design. Amplifiers are located in a room close to the screen to minimize the length of the wiring. The speaker towers for the LC, C and RC channel are mounted on wheels to be able to remove them. The screen itself can be pulled aside if needed to reveal a large stage. This stage is used at least once a year for New Years Eve party, with live music. The first five rows are removed to make room for a dance floor. Modified ST270 70mm take-up unit for old warped and buckled 70mm prints. 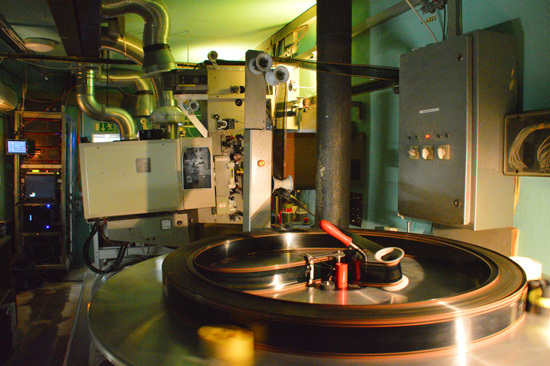 The projection room is equipped with vintage 70mm machines from Philips: a DP75 and a classic DP70, as well as a Kinoton ST270 non-rewind system for 70 and 35mm. Next to the historically correct 70mm projectors are two digital projectors; a Kinoton DCP 30 L (2k) and a Christie 4230 (4k). Schauburg is using a Volfoni shutter 3D system. 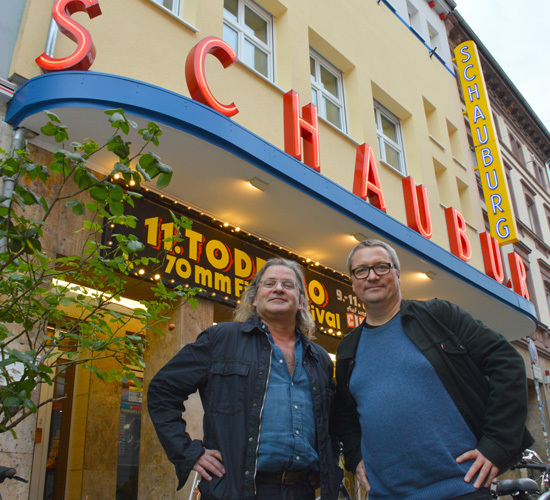 Although Germany has committed itself to digital distribution of contemporary movies, the Schauburg maintains its film projectors for real film shows such as this Todd-AO Festival, but also for other vintage 35mm film shows. The lamp houses are from Kinoton and equipped with a 7000 W Xenon lamp, which runs at 165 amperes when 70mm is projected. The main lens is a Schneider SUPER CINELUX (70MM) 75mm F2, designed for 70mm projection which gives a very uniform, bright and sharp image across the screen. It costs nearly USD 4000. The array of lenses also includes an Ultra MC 70c with 75,2mm focal length (for Curved Screens. That's why it is marked "70mm C") and the Ultra Panavision 70 anamorphic in combination with a 101mm focal ISCO special-design for 8-perf pulldown 70mm (though in this case it's only 5-perf). A BSS Soundweb is implemented as a flexible and expandable central sound processor. All signal routing and B chain alignment and functionality is handled by the Soundweb. Standard or modified cinema processors are used as pre-processors to handle certain film sound formats. Instead of a typical cinema installation which might daisy chain signal path, the pre-processors are directly routed to the Soundweb for clean and short signal paths. 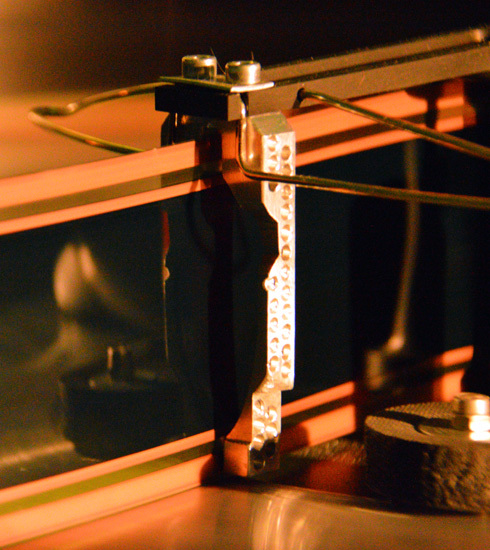 The magnetic preamps are custom build by Scherer Cinema Systems. For backup preamps can easily be switched to a Dolby MPU1. The Schauburg had some custom made 6-track magnetic heads manufactured with modified track widths and positions for better matching to old 70mm prints which often may have often become shrunken over the years. The new heads result in a much better playback signal. Magnetic 70mm sound also has the issue that there was no consistent standard for the pre-emphasis used for recording and it varied somewhat, studio to studio. There are some prints that sound quite different than the "normals". And a dubbed version may sound differently than the original version. Prints may also sound differently between reels when consolidating from different print. Schauburg aligns the preamps to an average pink noise of Dolby alignment tones. These features are accessible at the auditorium fader to adjust them when listening to the film. During the festival a laptop is used which has access to even more features. The sound system has been planned and designed by Gunter Oehme, Filmton und Kinotechnik. For the new readers of Cinema Technology, there may be some who are wondering what is all the fuss about this "Todd-AO 70mm". Well, 70mm film is a historical film format which was very popular from the middle of the 1950s until the early 1990s. 70mm gave the audience a very good illusion of reality thanks to the large negative area and multi-channel Hi-Fi sound. The 70mm format was utilized to photograph some of the grandest musicals and dramas the 1960s had to offer. You may have heard about "The Sound of Music", "Lawrence of Arabia", "Ben Hur" and many more. It was movie making at an epic scale with literally a cast of thousands. 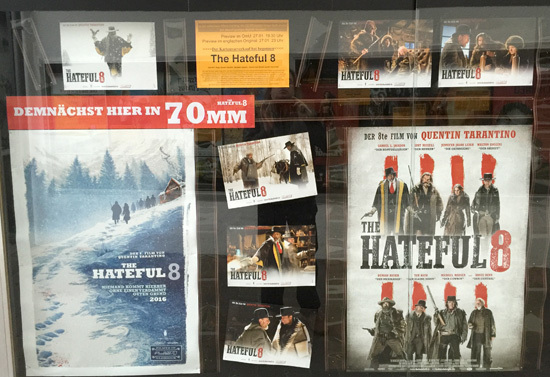 Some 70mm prints at the Schauburg are often first generation prints from the original premiere 40-50 years ago. Prints are in good physical condition considering their age, and the sound is often better - or more pleasing - compared to new films. Most of the vintage prints have faded into red, pink, magenta or brown nuances, but that does not seem to be a problem with the audience, although it is always a subject of debate when the blue and green color layers have "vaporized" and left the rest of the film somewhat monochromatic. Some even joke that new 70mm prints ought to be "factory faded" to protect the eyes of the seasoned 70mm festival viewer. In Germany, foreign films are typically dubbed, and presented in German dialogue. Some musicals keep the songs in English with German subtitles. Most of the dubbed versions even have German main titles which I think are quite exciting to see. The efforts that went into this so many years ago are staggering. The German actors very often really sound like their English/American colleagues, when they dub their voices. I know many will reject the opportunity to come and see it because of this. I really think they should come anyway and enjoy 70mm films - German dub or not. What does it matter? You cannot see this in a proper roadshow cinema anywhere but here. I often hear "Why are the films in German"? Well, it's a German festival, and many of the prints comes from German archives. "Can't you show English versions?". We'd love to, but there are no 70mm prints available of, for instance "Seven Brides for Seven Brothers". So, we settle for a vintage 70mm print of "Brides" in a German dub, because it is available and rare - and we still hear the songs in the original voices (and English). It is the only opportunity to see some of these in 70mm - it'll be German, or not at all, and we're trying to solve the "not at all" problem, at least somewhat. We do try to have a balance between German dubs and original English versions. The festival has a very loyal core audience which comes back year after year. Some have even been here all 11 years. It's the annual pilgrimage to Karlsruhe to see 70mm films and meet the same people from last year and to sit in the same seat as last year. No change please. First show is at 10 in the morning, and people go in. Some always sit in the very front row to be "consumed" by the large screen. Sunday around noon the "festival fatigue" usually sets in, but at this point you can see that the end will be coming by the end of the day. All films are introduced with interesting anecdotes about the production. Often a lecture Sunday morning sets the scene with PowerPoint and a short film clip. The audience may occasionally correct the lecturer with dates and details - but that's all part of the show. From time to time, rarely seen or forgotten 70mm short films are also presented Sunday morning. Todd-AO Festival organizers, Herbert Born (left) and Thomas Hauerslev. Note the neon, billboard and the flashing lights. It requires good understanding of the audience's needs to "nurse" them so they feel welcome and even be motivated to return next year. The Schauburg Festival ticket (a pass that gives access to all films during the weekend) also includes meals. That is right, except Friday morning, the pass includes full "Cinerama Lounge" breakfast Saturday and Sunday, full hot dinner Friday, Saturday and Sunday, as well as afternoon tea/coffee and a cake all three days. Short of a wake-up call in your hotel and a massage, the audience is well taken care of. It was quickly realized the first year how stressful it was for the audience to find something to eat between films. Thus, catering has been included since. Eating together also serves the social dimension of the festival when all things 70mm are discussed at the long tables outside in Schauburg's private beer garden. Included in the ticket also is a 48 page full color printed souvenir program especially made for the Todd-AO Festival. It includes detailed information and pictures of the films shown, as well as an article or two, relevant to the weekend. A treasure to take home and keep. Festival posters are also printed and hung all over Karlsruhe, as well as a free 5-panel festival flyer, which is distributed months in advance. The flyer can also be downloaded from the festival home page. The Schauburg beer garden is decorated with vintage posters and stills from the films. The displays are photographed and marvelled at by festival goers. On Friday night, festival sponsor the local brewery Hoepfner hosts a ”Hoepfner Get together” with free beers. A very popular event, for obvious reasons. Throughout the Todd-AO Festival weekend, two projectionists are working side-by-side for 14-15 hours each day. Projectionists Vincent and Marcus are always modest, smiling, and anyone interested in the projection technique are always welcome to have a look inside the projection room, talk and take pictures. It has become like an extra family after all these years. Children grow up, people get married, people turn 70 (the only authentic age for this audience) and 70mm friends are passing away. Once a year we all meet, see films, take pictures and talk. After 3-4 days in the dark we all separate again and go back to our normal soft focused and unfaded world of reality - unless we all "melt" or "turn to dust" when we are exposed to daylight. "Come on down! ", as the say on TV. Karlsruhe is a friendly city with some interesting trams to boot, so it's a great weekend trip for early autumn. Going to the Schauburg is highly recommended and a unique experience. But don't take my word for it. Judge for yourself when the 12th Todd-AO Festival returns in October 2016.